Aside from using malted milk balls in this recipe, I also had to pick up malt powder. It's not a usual pantry ingredient in our house so I'm on the search for other recipes calling for it. If you have some to share, please let me know! This ice cream recipe is cooked and uses quite a bit of egg yolks - 6 to be exact. As a result, it's super creamy and rich... and makes a great milkshake too. Chill the mixture thoroughly in the refrigerator, then freeze it in your ice cream maker according to the manufacturer's instructions. 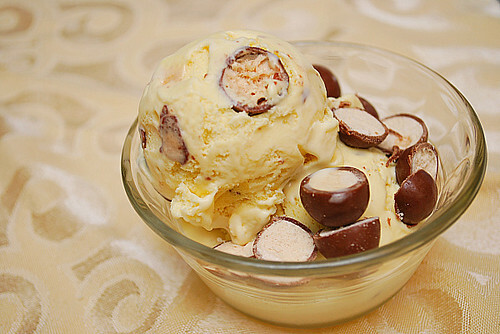 As you remove the ice cream from the machine, fold in the chopped malted milk balls. Place mixture in a freezer safe container and freeze overnight for flavors to meld before enjoying. I have always loved whoppers. This looks so good. This sounds great! And just in time for my BF's birthday dessert decision.